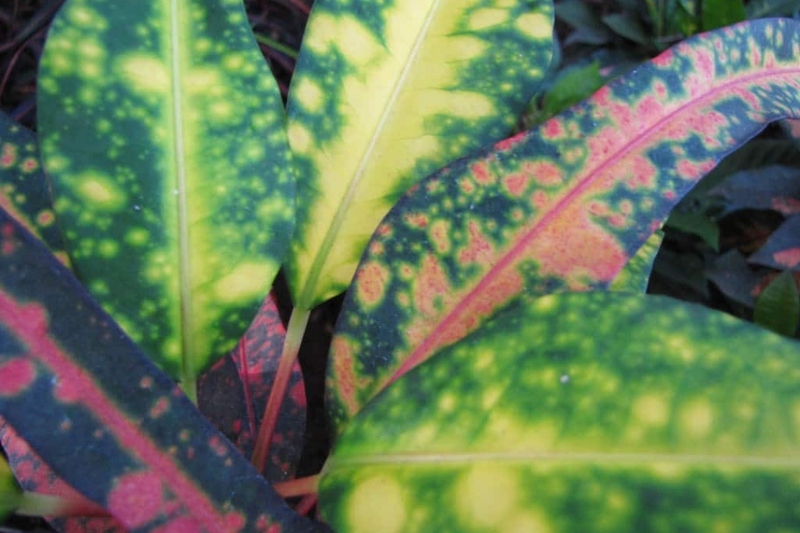 Garden croton (Codiaeum variegatum): growing, planting, caring. An exotic shrub with an incredible foliage! Codiaeum variegatum - the garden croton or variegated croton - is a species of plant in the family Euphorbiaceae, native to open forests of Indonesia, Malaysia, Australia, and the western Pacific Ocean islands. It is an evergreen shrub growing up to 3 m (9.8 ft) tall with thick, leathery evergreen 5–30 cm (2.0–11.8 in) long leaves, variegated with green, white, purple, orange, yellow, red or pink according to the cultivar, and 8–30 cm (3.1–11.8 in) long racemes with white male and yellowish female flowers on separate inflorescences. In tropical climates, crotons are grown as hedges and potted patio specimens but where temperatures do not normally drop below 13 °C in winter they are grown in greenhouses or as house plants. Croton is a perennial with a woody strain, with variegated leaves of 15 to 25 cm passing from green and yellow to red. In summer it develops small clusters of white flowers. Subtropical plant, your croton will enjoy temperatures above 13 ° C away from the direct sun, in a pot filled with potting soil and loam with sand or perlite at the bottom, to facilitate drainage. Crotons like very moist atmospheres, and aprreciate full light without direct sun. During growing season, keep the soil moist by watering once or twice a week. In autumn and winter, the plant is at rest, water less, with water at room temperature. Avoid using water that is too calcareous, and spray foliage regularly. At the end of winter every two years, repot your plant in a pot slightly larger than the current one, with a mix of loam and potting soil. If you can not repot, just replace the top soil with potting soil. A drop in temperature or being placed in drafts will cause your croton to lose its leaves. Look no further for the cause. Also watch for mealybugs. If you see them, remove them with a cotton swab soaked in alcohol. If you see red spiders, cleaning your plant with clear water can get rid of them.